Leave Roppongi Station from the ticket gate leading to EXIT 1c for “Roppongi Hills.” Enter the Metro Hat atrium and take the escalator up from level B1 to level 2F (66 Plaza 2F Park). Proceed toward the WEST WALK and the Grand Hyatt Tokyo. Enter the building through the door in the WEST WALK area. Going straight a few meters and into the passageway on the right side toward the Grand Hyatt Hotel. Take the escalator down to ground level. Exit to TV Asahi St. and turn left. Go straight past the stoplight at the corner of the Grand Hyatt Hotel. The Harks Roppongi Bldg. 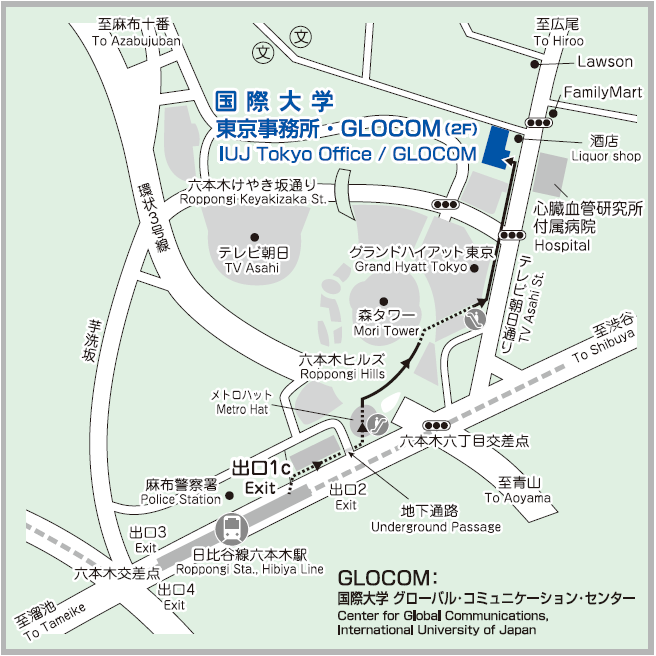 (IUJ Tokyo Office and GLOCOM is on the 2F) will be on the left before the next stoplight. To find the elevator, veer to the right after entering the main entrance Go to the 2F.